Our 9th state on this trip was North Carolina. We had 2 stops there, both right around Charlotte. First up, we stopped for dinner with Tim & Paula – both are vets who have served with CVM long-term in South Africa and also in Soroti. As we were talking, we realized that we actually live on the same road that they lived on when they were there 18 years ago! Then we spent 2 nights on the south side of Charlotte with our friends from Fuel Uganda. We have worked with them several times when they come for short-term trips and they are one of the partners that we work with in our Batwa ministries. We had some good chats with them thinking through some future ministry possibilities and we ate some really good barbecue. Hello! 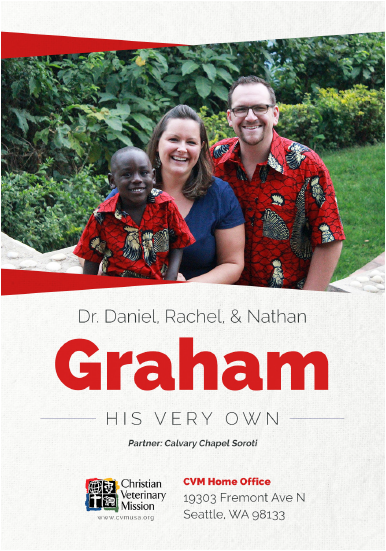 We are Daniel and Rachel Graham and we serve with Christian Veterinary Mission in Uganda. Our focus is on equipping local churches for missions and discipleship in their own communities through the use of sustainable community development projects. Read more on our About page or send us a message through the Contact page. Thanks for stopping by.